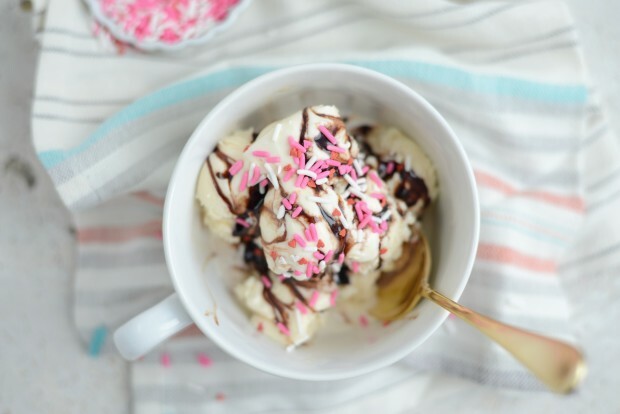 This homemade chocolate syrup is delicious! 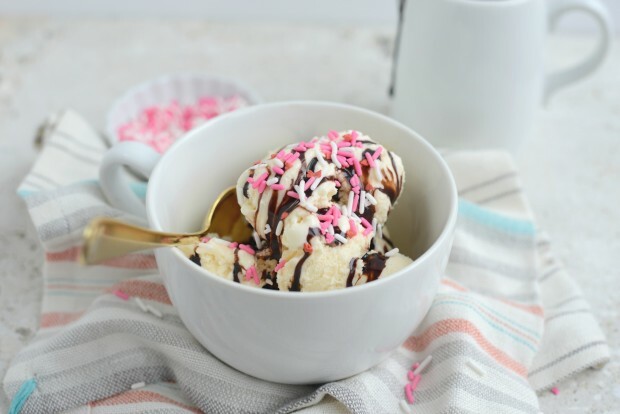 Squeeze it into a cold glass of milk, drizzle it over ice cream or pie. You can’t go wrong. 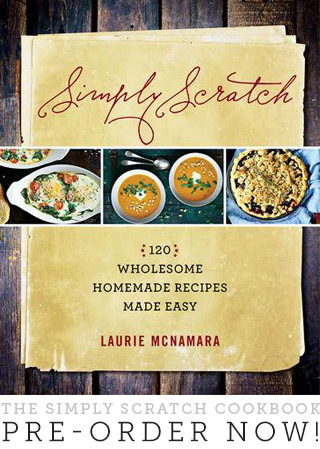 I Laurie, the blogger behind this here from scratch blog… bought… from the store… for the first time in my life (I think? )… Hershey’s chocolate syrup. I didn’t want to, trust me! But Haileigh had her boyfriend (<—– I know right?!) over and she wanted to make (meaning she wanted me to make) chocolate milkshakes. I didn’t have any of the homemade stuff in the fridge or the time to make any from scratch because we were gone all day shopping… so yes, I bought some. I looked over my shoulder as we checked out waiting for someone to say “ah-ha! busted!! !” but that didn’t happen because nobody knows who I am around these parts or any parts for that matter. So the next day I made a batch and threw out the store-bought bottle. But not before making my family do a blind taste test. 3 out of 4 chose my homemade over store bought! I thought Hershey’s was too sweet and my daughter who voted for it though it was mine because it was runnier and that’s why she voted for it. So perhaps it’s now 4 out of 4? 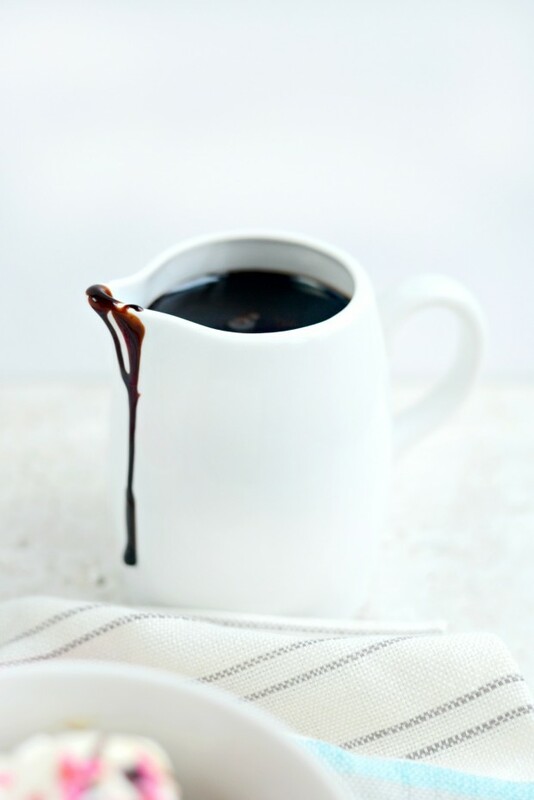 Homemade chocolate syrup is the bomb dot com. 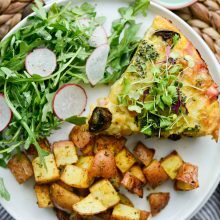 It’s a million-trillion times better (duh) than store bought, plus you can pronounce all of the ingredients that’s in it, which is always a good thing. 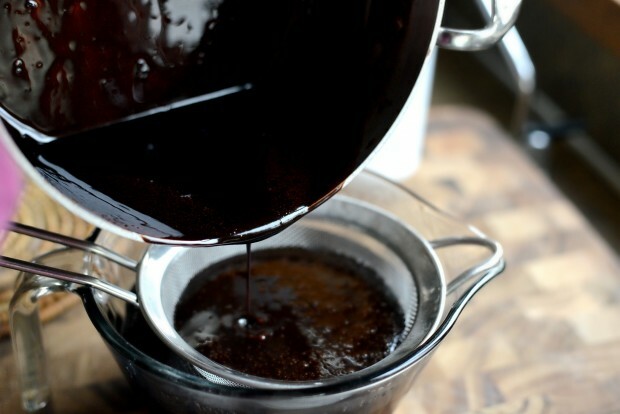 Squeeze this chocolate syrup into a glass of cold milk, over ice cream, pie or dip fresh fruit into a bowl of it. 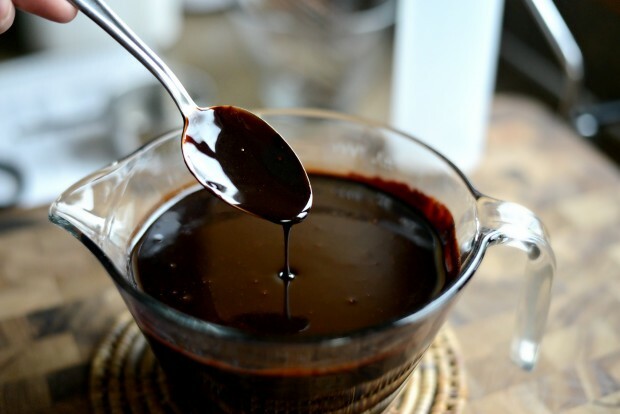 Seriously this chocolate sauce should be a staple in everyone’s fridge, for when one of those chocolate cravings strike or your daughter wants to make milkshakes for her boyfriend. 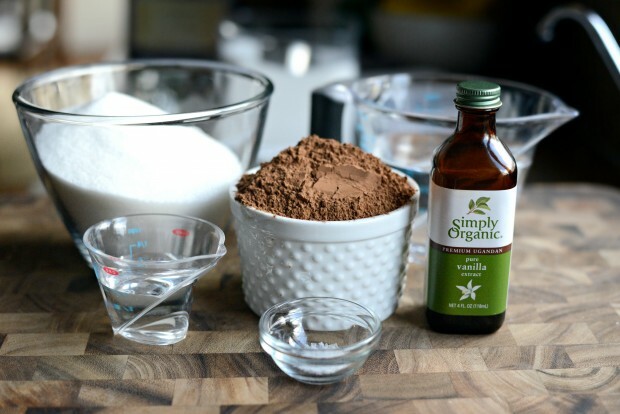 If you’ve ever wondered how to make the chocolate syrup, well then this is the post for you. 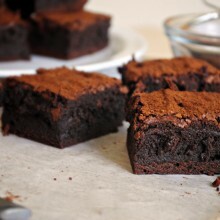 You will need sugar, water, Dutch cocoa powder or (cocoa powder processed with alkali), corn syrup, vanilla ice cream and sea salt. 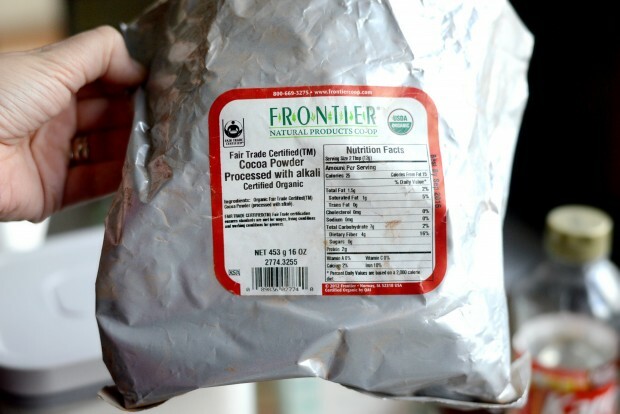 I used Frontier Natural Products. 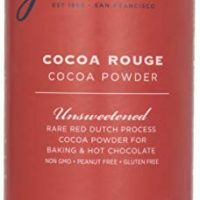 Unsweetened Dutch cocoa = unsweetened natural cocoa processed with alkali. 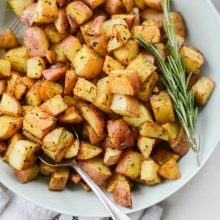 Why is it that natural, unsweetened, non-alkali won’t do? For a few reasons but mostly because its color (you want a dark syrup!) and it’s too acidic. 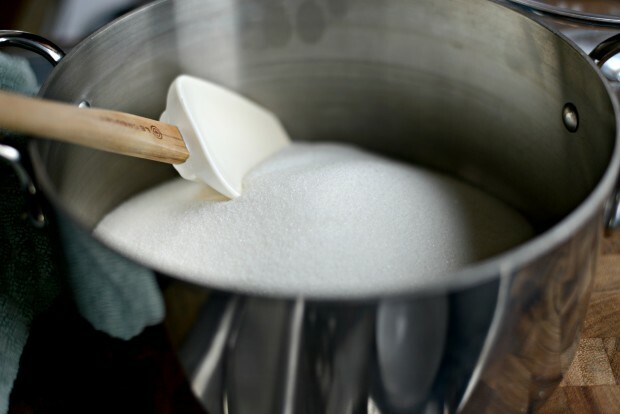 Add 2-1/2 cups of sugar into a heavy bottom pot. 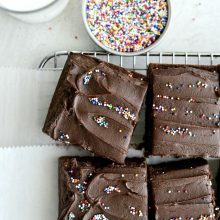 I know this seems like a lot of sugar, but this recipe makes around 3-1/2 cups, plus you only drizzle a little (like a tablespoon-ish?) into milk or on ice cream. So it’s not too-too bad. Stir to combine and heat over high. Gradually (be careful not to splatter yourself!) 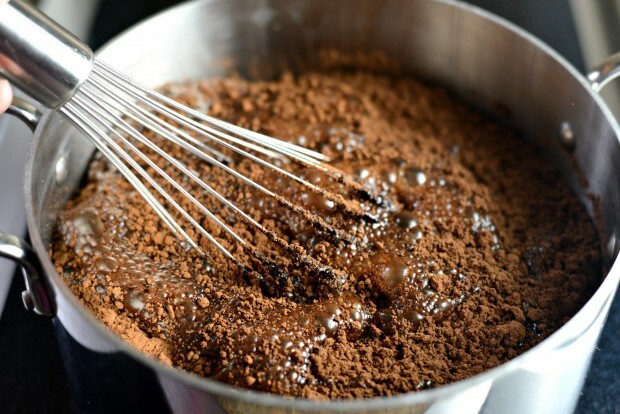 whisk in the Dutch cocoa powder. 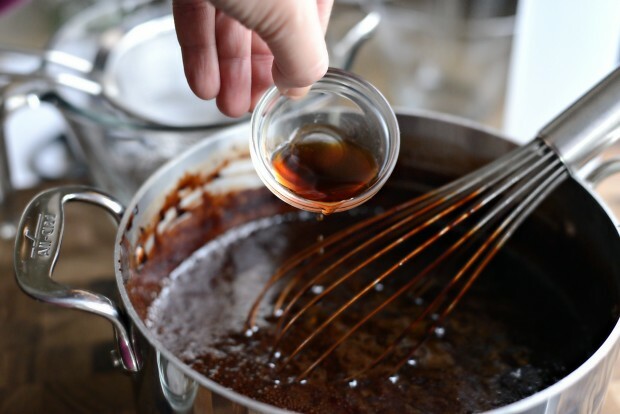 …and continue to whisk until the chocolate sauce has thickened slightly. 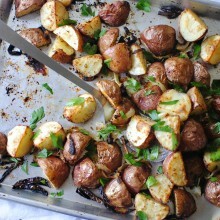 …and 1/4 teaspoon sea salt. 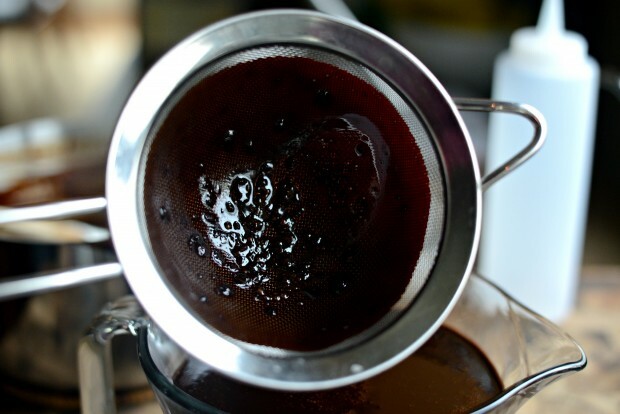 Pour the chocolate syrup through a mesh strainer that is set into a large bowl. This will collect any lumps of cocoa that didn’t get whisked in. 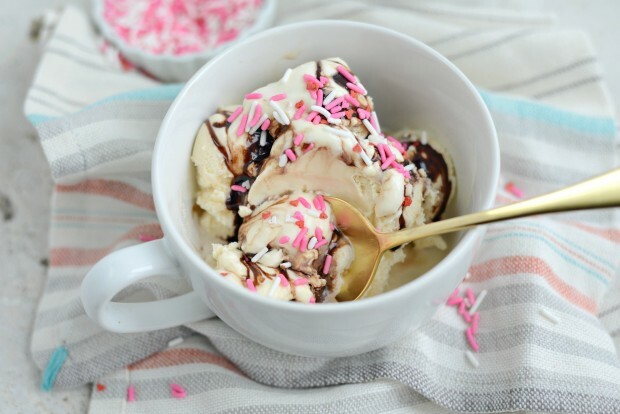 Leave the chocolate syrup out on the counter until it’s cooled down to room temperature. 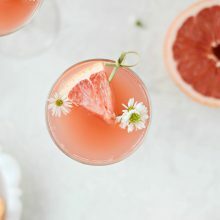 Once it has cooled, you can pour it into a squeeze bottle (I found mine at Sur la Table but I think Target has them too) or into a glass jar and store in the fridge for a couple of months. Once it cooled a bit, I then treated myself to a midday bowl of ice cream. 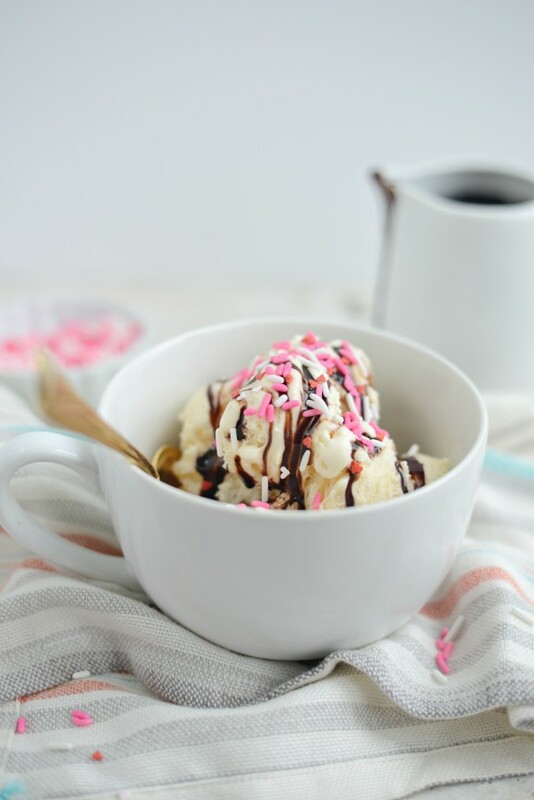 Words cannot express my love for the flavor of this chocolate syrup… it’s phenom! 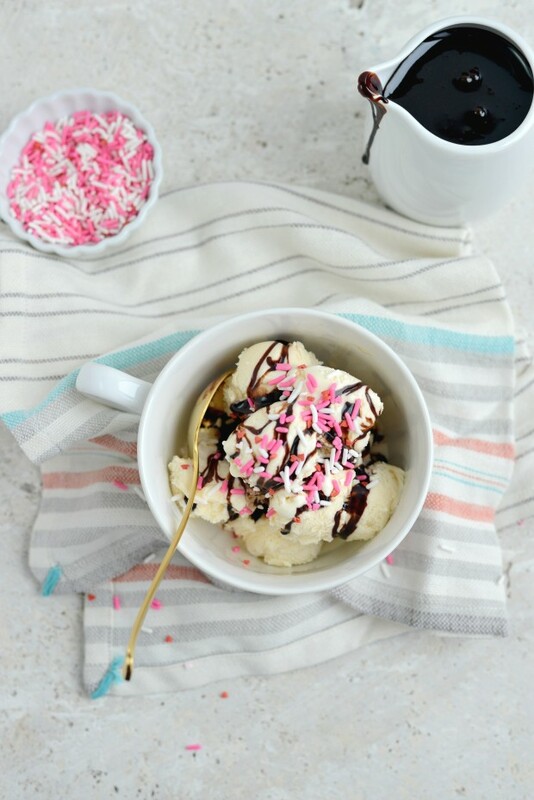 I’m not a fan of overly sweet things (hence why I don’t love Hershey’s chocolate syrup), and this is just perfect to me. 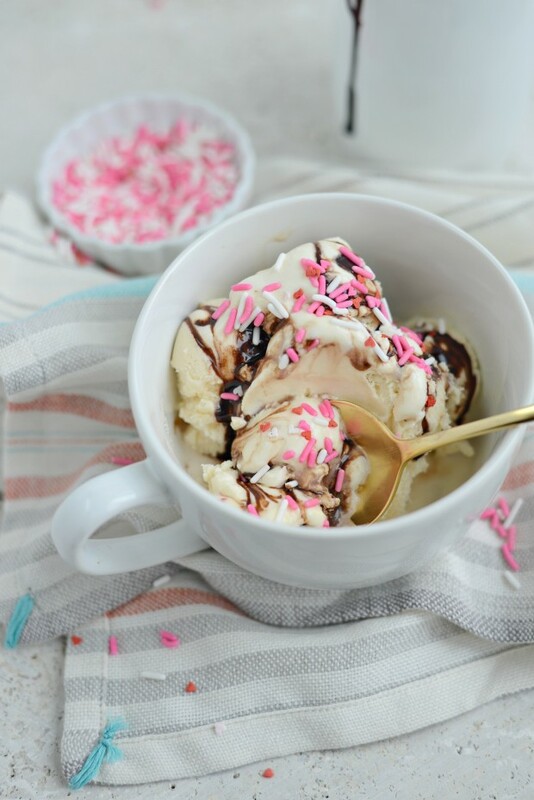 And what bowl of ice cream is complete without sprinkles? I found these super cute Valentine’s Day sprinkles in my hoarder collection that I currently have going on in my pantry. They use to have little kissy-lip candies among the sprinkles in this jar, but I think some little fingers might have picked them all out when I wasn’t looking. But, hey the hearts are super cute! 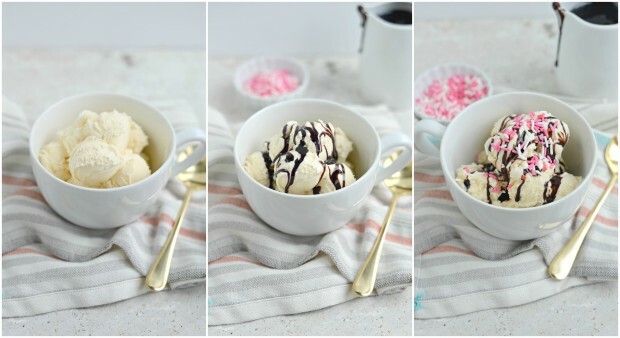 And because my good friend Heidi eats her ice cream in a coffee mug, we now do the same thing in our house. It makes eating ice cream while in bed a lot more comfortable and a ton easier. 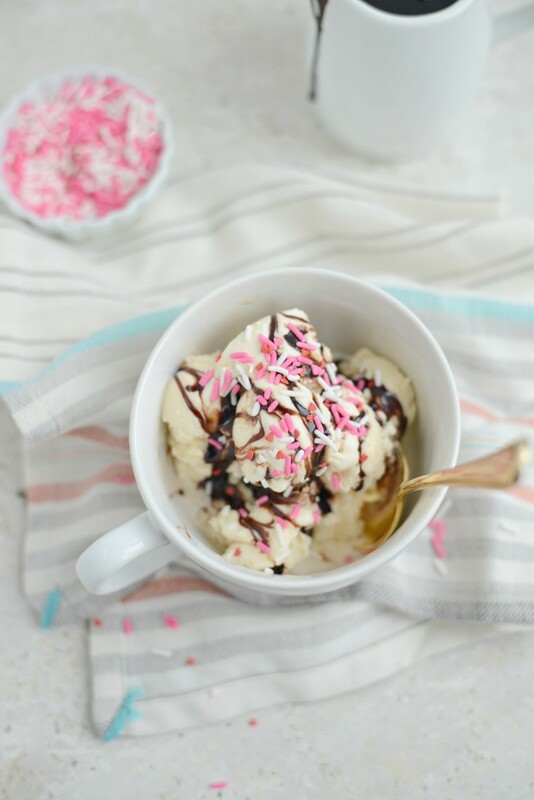 This homemade chocolate syrup is not only delicious but not overly sweet! Squeeze it into a cold glass of milk, drizzle it over ice cream or pie, or into a blender with milk and ice cream for a delicious milkshake! It's the BEST! Pre-measure all ingredients and have them ready to go before beginning. 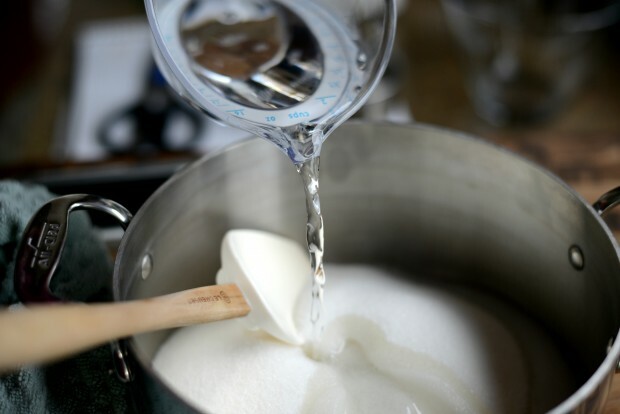 In a heavy bottom pot, stir together the sugar and water. 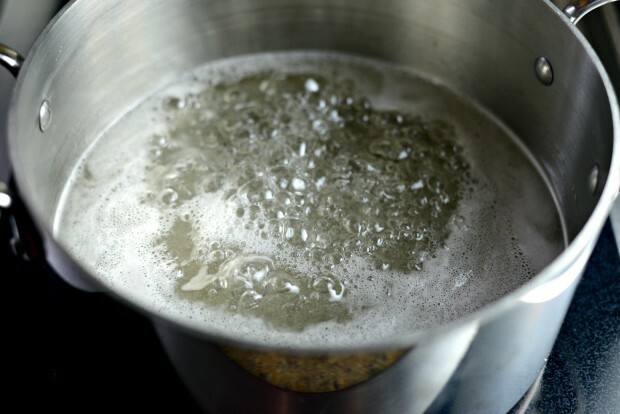 Heat on high and bring to a boil. 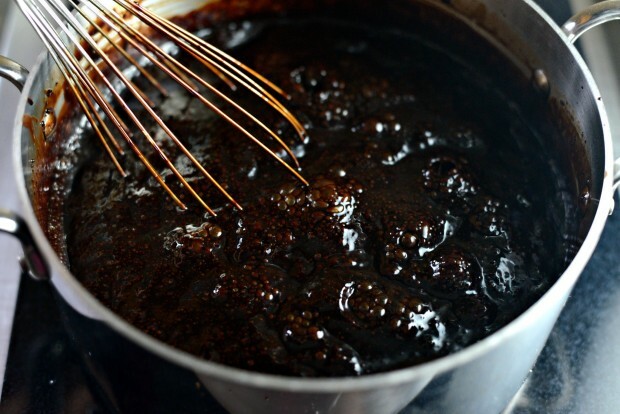 Once at a boil, carefully whisk in cocoa powder and corn syrup. 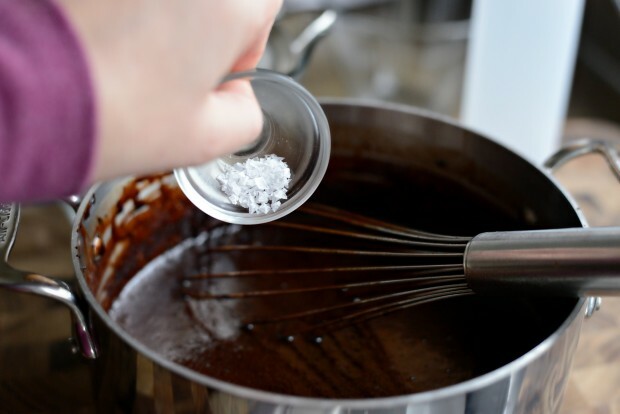 Whisk until the cocoa powder is completely blended in and the syrup has slightly thickened. About 1 to 2 minutes. 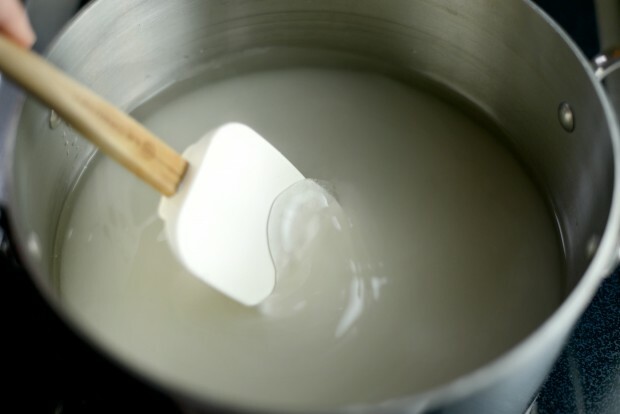 Remove off of the heat and whisk in the vanilla and sea salt. 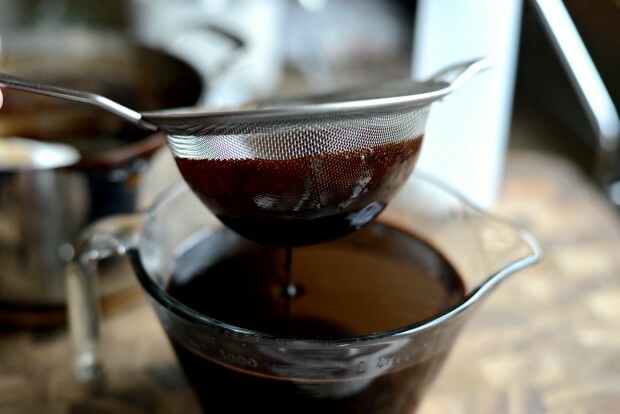 Pour the chocolate syrup into a mesh strainer set into a 4-cup liquid measuring cup to strain out any solids that didn't get whisked in. 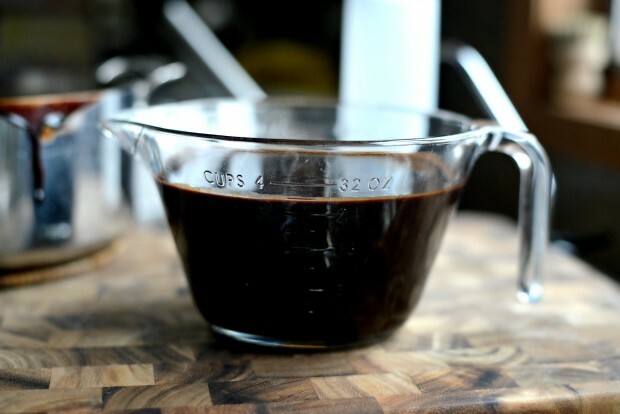 Allow time for the chocolate syrup to cool until at room temperature. Pour into a squeeze bottles or store in a glass jar. Can keep for a few months if kept refrigerated in an airtight container. 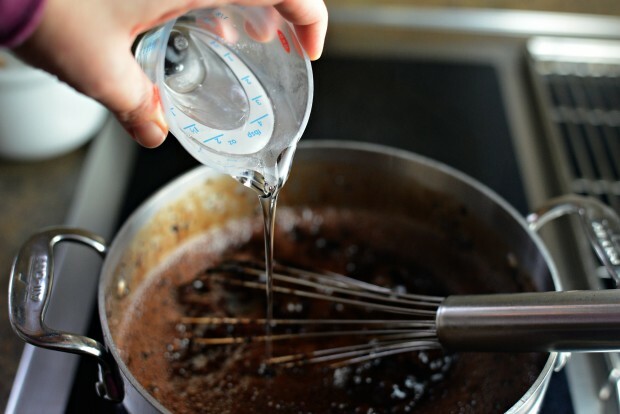 *Syrup may need to be warmed by running the bottom of the bottle or jar under hot tap water for a few seconds. Oooh yeah, this sauce looks perfect! Laurie, you rock! I refuse to use (much to my children’s chagrin) Hershey’s (if you look closely at the label, it is chocolate ‘flavored’ and is mostly corn syrup). I use their competition instead because it is actually chocolate syrup! Hi Flora! I haven’t tested it so it’s hard for me to say for sure. If you do try it, please let me know how it works for you!